According to yesterday's Edinburgh Evening News the total spend on the trams so far has been £372 million. As the population of Edinburgh at the last census was 448,624 this means that the project has already cost the equivalent of £872 for each man, woman and child in the city. If, as expected, the cost should the cost rise to £500 million this figure would rise to £1114. Over £4000 for a family of four. The city council has already provided £31 million directly, £69 per head, which can only be recovered via the council tax. Yet, the tram system that is being built is one line going from Leith to Edinburgh airport - or to be more precise from the Scottish Government building to 400m short of the airport terminal - apparently we can walk the last bit as we will be business types only carrying briefcases. 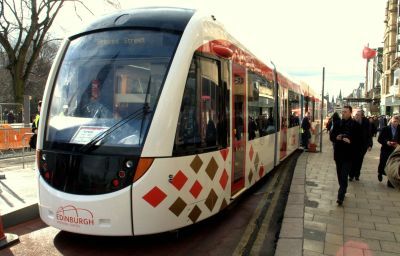 To work out how the trams will help you in daily life just work out out how often you go to Leith or the airport from the city centre and imagine how much better that would have been on a tram instead of the existing bus service. Yes, Edinburgh does have buses and they go on exactly the same routes as the trams will. Its a pity the council had not noticed that before deciding to spend all that money. And if you never go to these parts of the city you will never see a tram let alone travel on one.